1How much will my cabinets cost? Cabinets vary dramatically in price, just like cars or houses. Entry-level cabinets are less expensive than cabinets with special finishes and upgraded storage features. Amazing Cabinetry provides cabinetry that fits most any budget—from basic to bold. 2How long will it take to get the cabinets I order? Order time varies depending on the manufacturer and the complexity of the job. The minimum time is roughly three weeks and can be as much as eight weeks during peak times of the year. 3Can you design my kitchen from a sketch of the room that I provide? 4What is the best type of countertop for the kitchen? For bathrooms? For the laundry room? There are many possible countertop choices. As with cabinets, your budget needs to be matched with your desire for flexibility of design and product longevity. Solid surface, Quartz and Granite are all good choices. 5Can you match my existing cabinets or furniture? All woods and stains change color over time—some more so than others. In many cases, Amazing Cabinetry can find cabinetry that may be compatible with your existing cabinets or furniture. However, we cannot guarantee an exact match. 6What construction features should I look for when choosing cabinets? Certain construction features are a sign of quality cabinets. A savvy consumer will look for features such as finished backs in all cabinets, soft-close or self-close drawer guides, multi-way adjustable hinges, adjustable shelves, and a wide range of heights and depths. Newer convenience features include soft-close hinges, multi-function drawer systems, and optional task lighting. 7What are the most popular types of cabinets? While popular cabinet styles and trends vary from year to year, traditional raised-panel and Shaker styling are always a favorite due to affordability and durability. Besides these styles, certain wood species tend to be favored by today’s consumers. Maple is frequently used in remodeling because of its clean look. Cherry has become increasingly popular as manufacturers have developed a variety of finishes allowing it to work in more applications. 8Are environmentally “green” cabinets available at a reasonable price? Amazing Cabinetry represents several manufacturers across the price spectrum whose cabinets are certified under the Environmental Stewardship Program developed by the KCMA (Kitchen Cabinet Manufacturers Association). 9What’s the difference between manufactured cabinets and custom-made cabinets? Years ago there was a significant difference in the sizes and finishes available from “custom” cabinetmakers and the “stock” manufacturers. Today, many cabinet manufacturers offer custom sizing and finish that rival, and may even exceed, the possibilities of a local custom cabinet shop. 10Do you charge a design fee, measure fee or other fees in addition to the contract price for cabinets and installation? 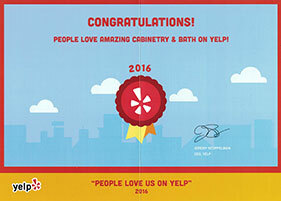 Amazing Cabinetry does not charge a measure fee or a design fee for a first design or estimate. In some cases, where multiple design revisions are requested, a design retainer may be requested. That retainer is then credited in full to the final cost of the job. 11Do you do major remodeling? 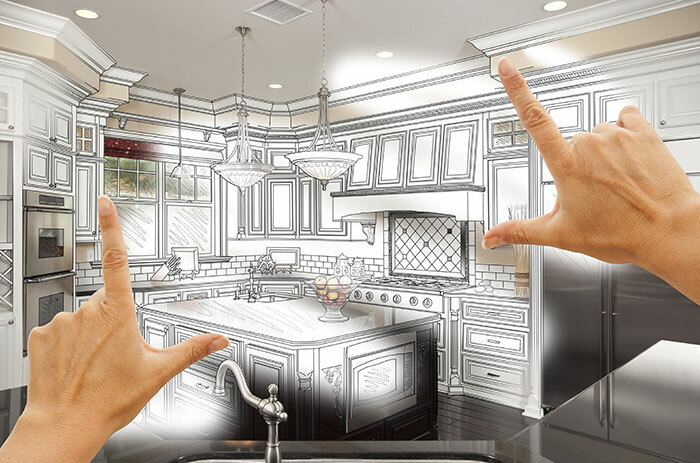 Amazing Cabinetry has full-line remodeling service for jobs that require major structural renovation. We specialize in kitchen, bathroom, and laundry room remodeling. 12Do you provide cabinets for remodeling only, or also for new construction? 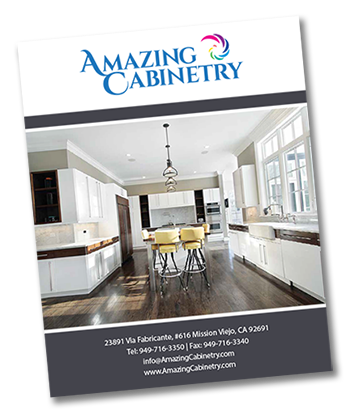 Amazing Cabinetry works with a number of reputable remodelers and can provide cabinets through your contractor or directly to you for your kitchen or bath remodeling project or room addition. We also work with many custom home builders, who consult with our designers to assure that the layouts for kitchen cabinets, bath cabinets, laundry room cabinets and other cabinetry are chosen to properly fit the budget and space. We will coordinate directly with your builder and also consult directly with you. The heart of your home, your kitchen is also hard-working command central. As a food production facility, homework station and entertainment center, it needs to provide solid functionality in every corner, yet you want it to project your personal style.